Learn what one company did to dramatically increase the performance of their font service and the stability of their overall system. We have a service-oriented architecture. One of these services is a font service that is responsible for serving font data based on family and Unicode range and checking permissions for user-uploaded fonts. We didn’t expect the font service to have a particularly high load (load is the average number of threads using or waiting for the CPU). However, last year we noticed surprisingly high load on the font service, especially at night when we actually had less traffic. Fortunately, we were able to find the root cause and dramatically increase the performance of our font service and the stability of our system overall. Here is how we did it. Figure 1: Server load before and after the change. (Fix was released December 21.). One of my coworkers found and deployed a neat flame graph tool from Brendan Gregg at Netflix. This tool combines data from multiple profiling tools to visualize resource usage by both native and JVM functions in a single graph. Each rectangle in the graph represents a single stack frame — the width of the rectangle shows how much of a resource, such as CPU time, was used, and the y-axis represents the call stack. To find problematic functions, you simply identify wide rectangles. This tool was invaluable in debugging the performance of the font service. Figure 2: A flame graph from a font server during high load. 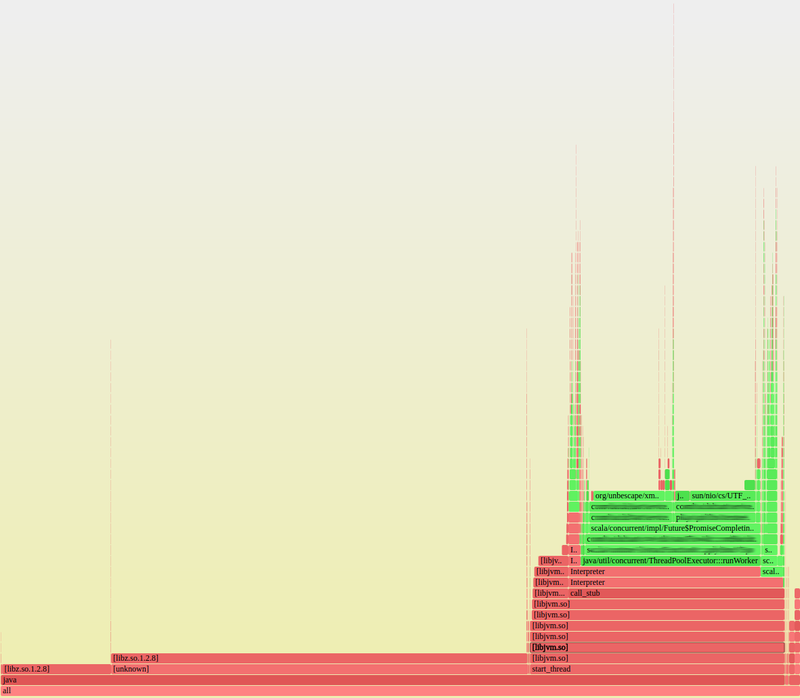 We collected several flame graphs from the font service while in a high load state. One of these flame graphs is shown here, along with a close-up of the JVM portion of the flame graph. We quickly noticed a pattern in these flame graphs. Most of the overall time was spent in libz.so (used for GZIP compression/decompression), and most of the time in the JVM was spent by XML escaping and UTF-8 encoding. Figure 3:A flame graph zoomed into the JVM portion. First, here’s a little background on how our font service worked. We stored font data in an Amazon S3 bucket with a separate object for each Unicode range for each font. Other services would request font data for a font family, a set of Unicode ranges, and a user. The font service would download the data for the specified ranges for every font in the family that the user had access to and then return an XML response containing all the data. This functionality is all pretty simple, and there wasn’t anything obviously computationally intensive about it. And yet, we had a high load. 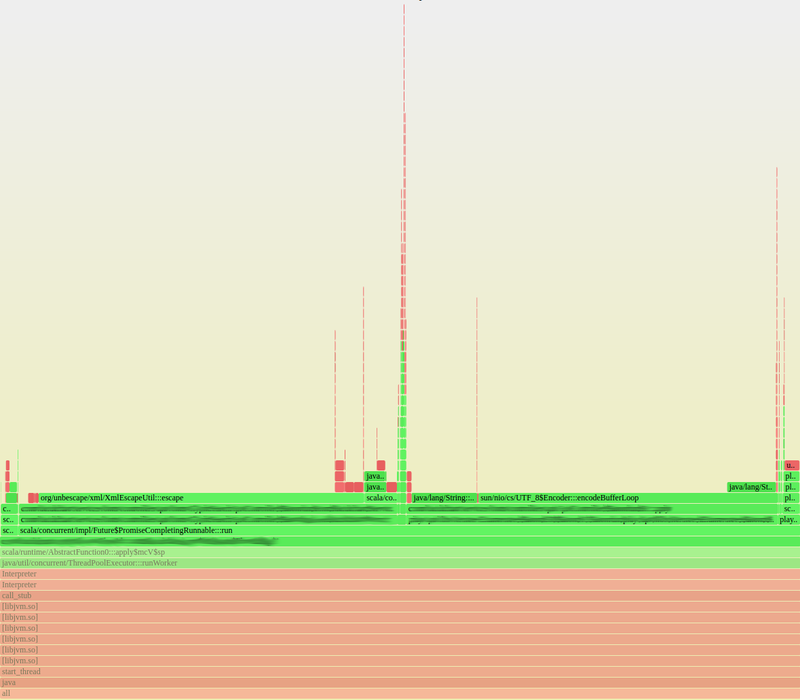 The flame graphs helped us identify that libz, XML escaping, and UTF8 encoding were using a lot of CPU. But why were we spending so much time encoding and compressing? Remember how I said the load was highest at night? Well, night for us (US Mountain Time) is daytime in Asia. While we were getting less traffic at night here at home, a lot of users elsewhere were using Unicode ranges of Asian languages like Chinese, Japanese, and Korean during this time. It turns out the font data was significantly larger for these ranges. This data was gzip decompressed and UTF-8 decoded and then XML escaped, UTF-8 encoded, and GZIP compressed. For the tiny Basic Latin range, this process wasn’t a big deal. However, a single CJK range is two orders of magnitude larger than the Basic Latin range (1MB compared to 60KB). For these larger ranges, all these transformations overwhelmed the CPU. Gzip compression and decompression are relatively expensive, and XML escaping isn’t exactly speedy. The content of the response from the font service was essentially just a collection of raw data from S3. The font service did perform some important additional tasks, like permission checking and looking up font keys from the name of a font family. However, there was no reason why the font service had to proxy the font data from S3. Our solution was straightforward. Rather than downloading and re-encoding the font data in the font service, we simply responded with a list of direct links to the S3 objects containing the font data. This change reduced the load on our font servers to almost nothing (see Figure 1). It also had no noticeable impact to the client services. Although our first attempt was successful, I should note that we deployed it with a feature flag that lets us turn it on for a percentage of requests to test that it worked well before turning it on 100%. By profiling our production servers, we were able to find and eliminate unnecessary work that our servers were performing. Here’s a look at some key takeaways from our experiences. Use profiling tools such as flame graphs to identify functions that are hogging the CPU. Compression and other encodings can be expensive. Published at DZone with permission of Thayne McCombs , DZone MVB. See the original article here.